Beach Armoured Recovery Vehicle. A modification of the Sherman tank that was designed to recover broken down vehicles that became immobile on beaches during assault landings. D-Day was the first phase of the Allied campaign to defeat the German armed forces in Normandy. The aim of D-Day was to gain a foothold in France from which the Allies could then advance and defeat the Germans before advancing towards Germany. The Allied landings on mainland Italy in 1943. The Allies landed in Sicily as they were not yet prepared to land in Northern France. The codename for the floats that the Whale roadways floated on. A type of beach defence used by the German armed forces in Normandy. The Belgian gate was a large metal barrier designed to prevent landing craft and vehicles from approaching the beach. Also known as Element C.
The highest level of security clearance, introduced by the Allies before D-Day to help keep their plans secret. 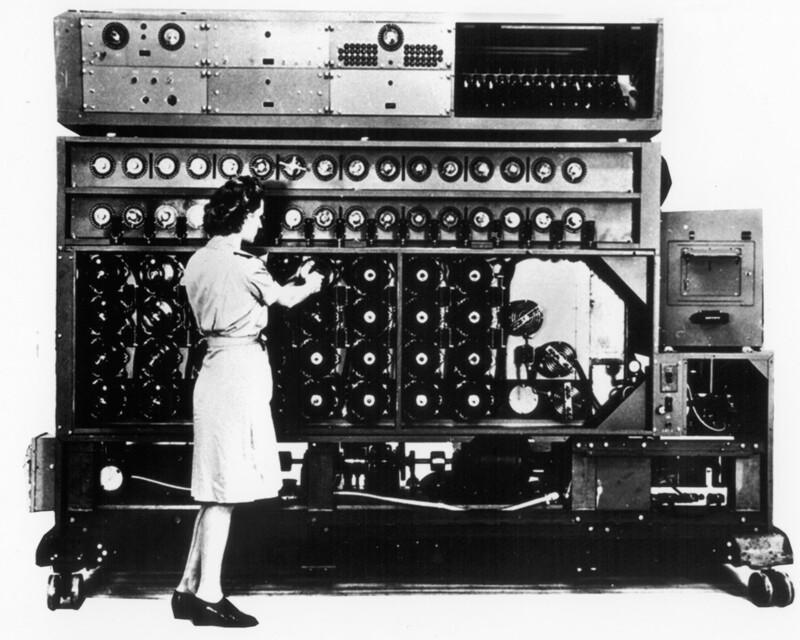 Bletchley Park was the central site for British (and subsequently, Allied) codebreakers during World War II. It housed the Government Code and Cypher School (GC&CS), which regularly penetrated the secret communications of the Axis Powers – most importantly the German Enigma and Lorenz ciphers. This enabled the Allies to know what the Germans were planning and to adjust their own plans accordingly. The description of the German tactics of ‘lightning war’. Particularly used to describe the German invasion of much of Western Europe in 1940. The codename for a British offensive between 30 July and 7 August 1944. The objective of the operation was to exploit the success of Operation Cobra, breakout to the south-east and to capture the strategic point at Mont Pincon. A type of thick hedgerow found in Normandy in 1944 and often impossible for tanks to move through. Often the bank of the hedgerow could be six feet high. Bocage can refer to either a single hedge or larger areas of Normandy that had this kind of terrain. Modern farming methods mean that much of the bocage has been removed since the end of the Second World War. The codename for a deception plan developed by the Allies before D-Day. Bodyguard was the overall codename for a number of other deception plans, including Fortitude. A type of map produced by the Allies before D-Day. The names of French towns and cities were changed for other places in the world to make it harder for anyone to work out which area the map covered. The build-up of US forces in Britain from early 1942 onwards. The codename for the landings by the US 82nd Airborne Division on the western flank of the landing beaches in the early hours of D-Day, around the town of St Mère-Église. Sword and Gold beaches in Normandy, France where British forces landed on D-Day.